Are you looking for affordable kitchen countertops in Maryland, Northern Virginia, DC, Baltimore or Alexandria? We have been in the countertops business for many years and have learned some money saving secrets along the way. Keep reading to discover some of our best strategies and ideas for getting a great deal on the perfect kitchen countertops. If you prefer to speak with a kitchen countertop installation expert, give us a call at 410-712-0601 and get answers to all your questions. Or click here to receive a free estimate. The best way to find affordable kitchen countertops is to consider whether you’re looking for immediate savings or long-term savings. Distinguishing between these two timelines can have huge affects on upfront costs and the life of your countertop. Sure, you can save money immediately by choosing an inexpensive material with very basic options. However, these materials might not be as durable or last as long as more expensive materials and you may need to upgrade again in the future. If you have to replace kitchen countertops every 5-10 years, are they still affordable? Alternatively, you can select a top of the line countertop, which costs more upfront, but requires less maintenance and possibly no replacement in the future. If you outfit your countertop with fancy edge options, it may significantly increase the value of your home. This means that even though you’re paying additional money upfront, you’ll actually end up saving more over time than if you selected the lowest priced countertop. So you have to consider, do you want your countertop to be affordable in the short term or long term? Read the sections below to determine how to find the most affordable materials and options. Click here if you’d like to go directly to our kitchen countertop prices page. When looking for affordability in a countertop material, you want to consider what you use your countertop for and how often. Do you mostly eat out and just use your countertop to organize clutter? Or do you cook every night and use your countertop for food preparation? Are you looking for a countertop for a kitchen island? Consider these questions when brainstorming about kitchen countertop ideas and try to strike a balance between price and durability. 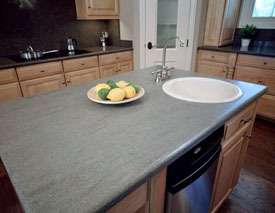 Click here to learn more about different kitchen countertop materials. Almost every countertop is available with an assortment of different colors, edge styles, and sealing options—ranging from basic to ornate. One way to make a luxurious countertop material more affordable is to select only the most basic options. However, keep in mind that more ornate options can raise your home value when it comes time to sell. Also consider the importance of a countertop that really enhances your kitchen’s look. A fancy edge style or color may cost a little more, but it may fit better with the rest of your kitchen. If you see your countertop everyday, upgraded options may be worth it. You’ll certainly be less likely to look for a replacement if your countertop fits perfectly with your kitchen aesthetic. So again, it comes down to whether you want a countertop that’s affordable in the short term or long term. Click here to learn more about kitchen countertop options. We know finding the best kitchen countertop for your budget can be overwhelming. We’ll let you in on a little secret: there really is no best choice. Each countertop has its own unique benefits. We’ll provide you with an in depth kitchen countertops comparison focusing on which materials and options work best for you. We’ll take into consideration the style of your kitchen, how often and what you’ll be using your countertop for, and your budget. We’ll even take Mother Nature into consideration, and show you our new eco friendly kitchen countertops if you’re looking to lower your carbon footprint. Click here to discover some of our favorite kitchen countertop ideas that will make your countertop truly your own. If you’re ready to take the next step and improve your kitchen, call the experts at Express Countertops today at 410-712-0601 and order affordable kitchen countertops for your Maryland, DC or Northern Virginia home. Or click here to request your free estimate. Express Countertops is home to the famous “one week installation guarantee.” How do we do this? We focus solely on selling and installing countertops… nothing else. This means once you’ve made your decision, we’ll be right over to begin the installation process. We know how important a kitchen is to a home, and the last thing we want is to be in the way!